"Y'all ready to turn up? 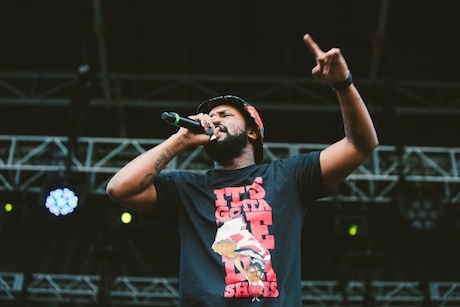 I don't like none of them standin' around shows," announced Schoolboy Q from the Green Stage, and the crowd obliged, whipping themselves into a frenzy early for "Hands on the Wheel." "Prescription/Oxymoron" and "Druggies Wit Hoes" preceded "Collard Greens," during which the crowd clearly expected Kendrick Lamar (whose set was mere hours away on the same stage), but Q handled things independently, proving he didn't need Lamar by rapping his verse. The crowd, meanwhile, ate it all up, chanting Q's name every chance they got, waving their higher-than-average number of bucket hats in the air during "Hell of a Night." When he asked the crowd how many ladies came with their boyfriends to a loud response, he was audibly disappointed, but it hardly showed on party-starters "Studio" and "Gangsta Gangsta," perfect examples of fan appreciation of Q's latest album, Oxymoron. His set was heavy on his new record, and the crowd's response throughout indicated that it was the right call.